When I was still what I consider "new to blogging" something really cool happened. I found Hillary's blog Wee Wonderfuls. I saw that she published patterns that could be purchased through her online shop. I bought this one immediately and made an aviator bunny for my nephew. I loved buying a pattern from somebody that I felt like I "knew" and my love for supporting the handmade movement via blogging was born. Hillary seems to be one of those girls who does a little bit of everything—my favorite kind of blogger. Her blog is a mess of adorable pictures of her kids, vintage fabric prints, embroidery, and knitting, oh and witty writing. What's not to love? Z-cakes even has her very own doll from one of Hillary's patterns thanks to her Grandma G. She loves it. And I love that she loves it. But the thing that made me most excited, was when I learned that Hillary was publishing a book . And what a book it is. Flipping through this baby I pretty much crumpled into a puddle of adoration on the floor. I believe I also vowed to never buy another stuffed animal from a store ever again. A little over the top I know, but I tend to go overboard with my promises when I'm looking at craft books. I want you to be able to flip through the pages of Hillary's new book too! And maybe even make some softies for the holidays! 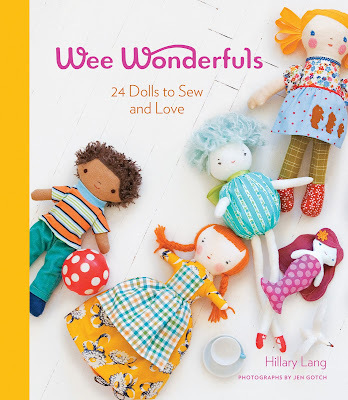 Hillary is kindly offering her new book, Wee Wonderfuls: 24 Dolls to Sew and Love to a Narrating Life reader! :: Check out Hillary's blog as well as her online shop. Have you seen her embroidery patterns? :: Leave a comment on this blog post: Tell me about your favorite doll/toy that you had growing up. Congratulations April! Please email me to claim your Wee Wonderfuls book! My mom made us homemade cabbage patch kids for christmas one year. I still have mine. Umm....I WANT this. It is on my Christmas wish list. So adorable!! My favorite doll was "bunbun." I actually still have her packed away somewhere safe. She's a little white bunny that my dad gave me for my first Valentines day. I always loved her. This book is currently on my wish list! So darling. I forgot to say that my mom made me a doll when I was little and then made us matching nightgowns for Christmas. I was totally smitten. And I have your button on my sidebar. I think a foray into embroidery is right around the corner for me. I had two favorite dolls. One was really special to me because my left it on my bed as a surprise. The other was a premie cabbage patch kid. Have I mentioned that this is the best series ever? I especially like the links to other crafty blogs that are new to me. Still got that button. Handmade is best! My favorite doll is named Kelli, after the daughter of one of my mom's friends. I got her for Christmas when I was 2 and would carry her around by the hair, so it's mostly missing and what's left sticks straight up. She's made of red terry cloth with a plastic head and hands with a white pom pom on each foot (well, end of the leg, there aren't any feet really). She has holes from where she got bit by a dog with a patch to cover them that looks like a bib. She traveled with me everywhere, and still sits on my bed (and I'm 26). She was a present from my next door neighbors who are like grandparents to me. Tomorrow I'm flying out to attend a memorial service for one of them, and I'm thinking I should bring Kelli with me. He was 93 and she is 94, and still lives next door to where I grew up. I need this!!! 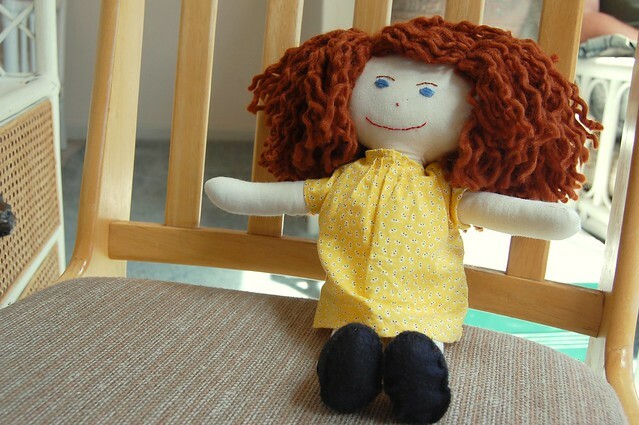 Didn't you just read on my blog how I wanted to find a handmade doll for Ella for Christmas?! It is her one Christmas gift and I am totally buying a pattern for these adorable dolls! I don't know if it was my favorite, but I had a big Rainbow Bright doll and her Rainbow house that I loved to play with as a kid. I also have my first doll. It is a little pink, cloth doll that my grandmother gave to me at birth. She passed away when I was little and I have since given it to my daughter. It holds great sentimental value for me. I have the button and I harmonize with Peggy in saying how much I love this series!! It is really opening my eyes to a new world of possibilities that I didn't know were avaliable here in cyber-space. And my favorite doll for a while was a teddy bear that I named Pip. And I still have your button prominently featured on my blog. My favorite doll was named Katie. She was made by my 5th grade teacher, and today she sits in a spot in my office where I see her all the time. My favorite toy was this little white (and later dingy gray) stuffed bear that I won in one of those claw toy grabbing machine thingies in Seaside, OR. I named him Furry, despite his obvious lack of fuzzy fur. He had a voice. He got blamed for things that went wrong around the house. Eventually my little cousin started blaming Furry for things too. Furry had to have surgery multiple times due to stuffing hemmorhaging, and eventually his glass eyes got all scratched up (and I told people he had cataracts), but I still loved him. I had an stuffed elephant that I loved as a child. It was Babar's wife Celeste, I still have her today. Oh cabbage patch kids. Weren't they great? And my care bears were favs too. Love this book! So fun to make as baby gifts or for my sweet neices...since I have boys...I need to get a little monster book and make them some adorable cuddle buddies. I had cabbage patch dolls, strawberry Shortcakes, even JEM! Remember her? With the cartoon show and everything! I think that was my favorite, she was bigger than Barbie so she couldn't wear Barbie clothes, but way more glamourous! thanks for a rad giveaway! I had a Red Fraggle doll that I loved. My blog still gots your button. My favorite was a monkey that my mother stole/borrowed permanently from grandma's toy box because I loved it so much. I already bought a copy of this book, but my mom wants one for Christmas, so that would be so fun! Hillary's work is amazing; I've been reading Wee Wonderfuls for a long time now. I wish I could remember my first doll, but I do remember that I had many Barbie dolls and my mother would sew hundreds of different outfits for her every Christmas. Thank you for the chance. My favorite doll was handmade by my grandmother and I still have her safely tucked away! Thanks for the chance to win this great book. I had a stuffed Cookie Monster. He had little rattles in his eyes, but I still liked my sister's Oscar the Grouch better. My favorite toy was my teddy bear, Bear. (So creative, I know.) In fact, I still have him. And I may or may not have continued sleeping with him up until I got married. Hillary's teddy bear would be much cuter, I'm sure. Bear's head is currently deciding whether or not it wants to stay attached. Love the extra button entry!